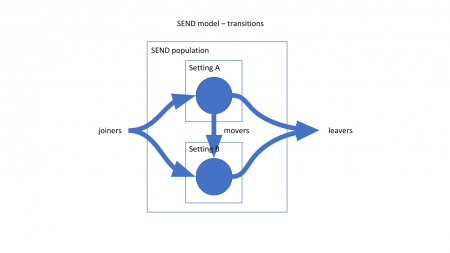 When developing the Witan SEND model we talked to local authorities (LAs) about what was most important to them when doing projections for their SEND population. One of the things we kept hearing was the need to be able to model “alternative scenarios”. 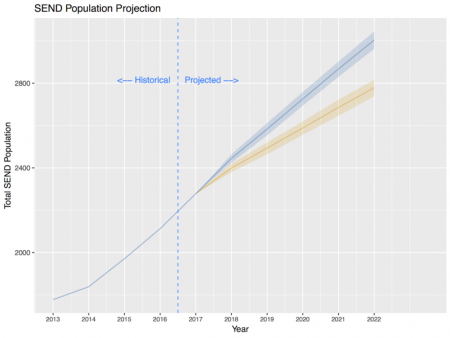 Being able to project the future SEND population and the cost to serve that population is really valuable to LAs, but budgets and capacity are limited, and if a projection indicates that future demand will exceed those budgets and capacity, then the Witan SEND model can show you where the gaps are and hence begin to shape potential alternative scenarios. Working with LAs, we are able to define and test their scenario ideas, which can then lead to policy change or other critical decisions being made (for example an extension to a school which caters to a specific need). In the Witan SEND model a person is described by their ‘state’, which is the combination of their primary ‘need’ and the ‘setting’ in which they receive education and support. Each setting is available for one or more year group. At the beginning of each academic year a person will move from one setting year group to another setting year group. This move is described as a ‘transition’. People who join the total SEND population we call ‘joiners’, and those leaving, ‘leavers’. People moving from one setting year group to another setting year group we call ‘movers’. A simple illustration showing only two settings, A and B, and the transitions between them, is shown above. 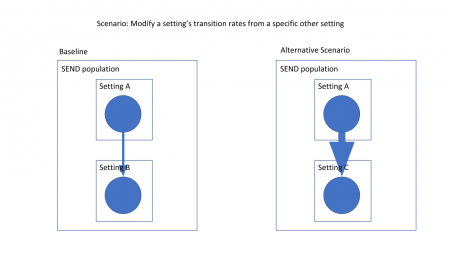 By default the Witan SEND model uses historic data about transitions between states to model future transitions that may occur. This is our ‘baseline projection’. 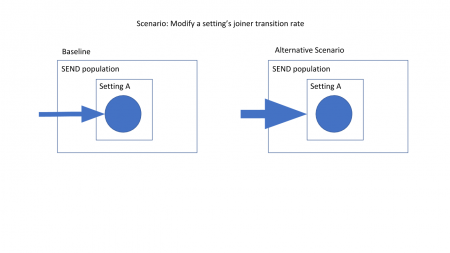 However, policy or service provision changes may mean that historic transitions are not representative of expected future transitions – we describe projections based on different expected patterns of transitions as ‘scenarios’. A common scenario LAs wish to test is what would happen if people with new EHCPs were directed to alternative settings. For example individuals with social, emotional and mental health needs (SEMH) in Year 7 may typically be placed in setting A. It may turn out that setting A is not the optimal setting for SEMH, either because it is not cost effective, because it doesn’t lead to the best outcomes for pupils, or perhaps because the authority simply doesn’t have enough capacity for those pupils. 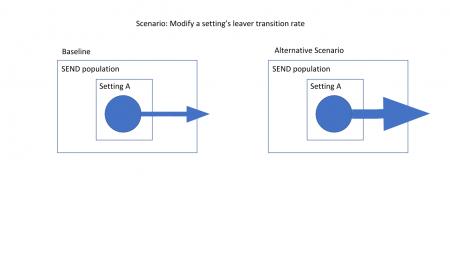 We can then test what the future population and cost profile would look like if we were to divert a certain proportion of new individuals previously joining setting A at Year 7, instead to join setting B. The above example is a relatively straightforward scenario for us to simulate (see 2b). Below you will find a list of the types of scenarios we can currently simulate. 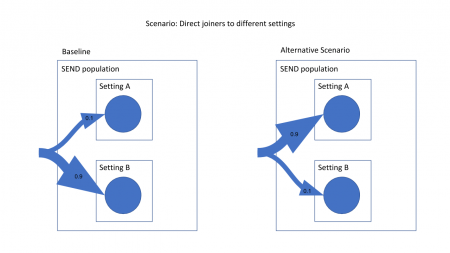 These can also be combined in all sorts of ways to test a wide variety of more complex possible scenarios – some further examples of combining scenarios are outlined later. Finally with our alternative scenario and baseline run (the default model behaviour) we are able to compare the two possible futures to evaluate whether the proposed scenario or policy change is likely to be effective in achieving your goals. 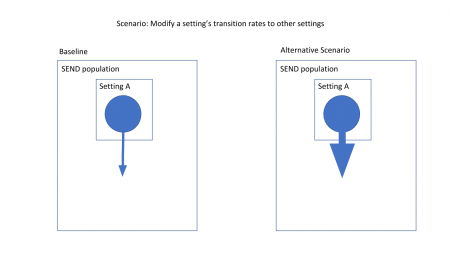 This can be repeated any number of times to model differences between alternative scenarios. 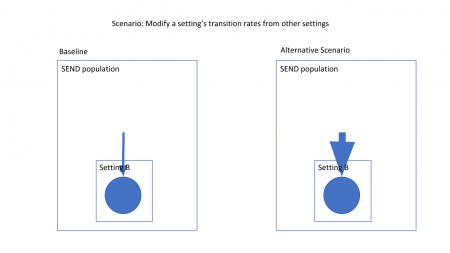 For example if you wanted to test multiple different levels of modification on any rate – to explore the overall range of possible impacts, modify any of the rates above by e.g. 10%, 20%, 30%, 40%, and so on, to understand at what level you would achieve budget or capacity goals, and let you assess the realism of those goals.